The Zero G Corporation operates a modified Boeing 727 called G Force One. It’s mission is simple, flying in a series of vertical parabolas it creates a zero gravity environment for those in the aircraft. 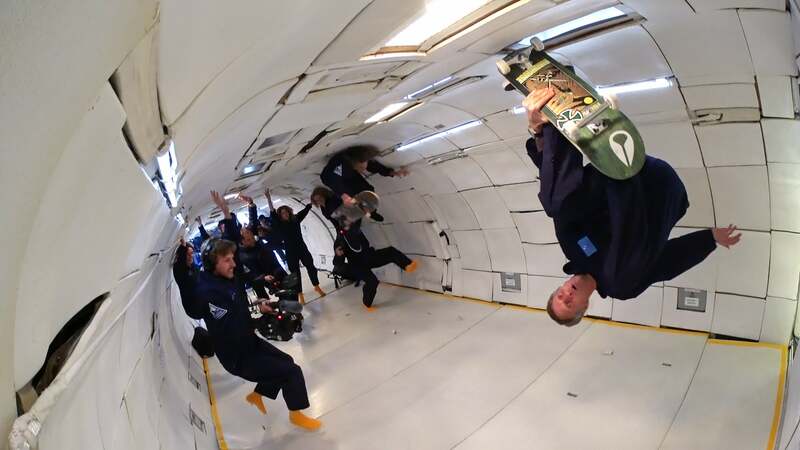 To the best of our knowledge, this spring was the first time the plane had been converted into a skate park when skateboarding legends Tony Hawk and Aaron "Jaws" Homoki took a ride in the plane that’s sometimes called The Vomit Comet. Along with a small crew of filmmakers and technicians, Hawk and Jaws set out to do skate tricks that they have only dreamed of doing on terra firma. The film crew, led by veteran 900 Films Director Jared Prindle used a variety of Sony cameras including 4K Action Cams, the α7S II, FS5 and FS7. Shooting at different frame rates and from various camera position inside G Force One, they created a film of Hawk and Jaws pulling off tricks that simply aren't possible in any other environment within the Earth's atmosphere. Tony Hawk, Jaws and The 900 Films crew have done more than their share of crazy shoots, but nothing like this. Prindle explains, "It was completely different. In most cases, we are either shooting travel and documentary style shorts or shooting Tony trying and achieving new tricks in skateboarding. He’d be pushing himself and I try to show the tricks in a way I feel looks the most exciting and we both have decades of experience doing this. 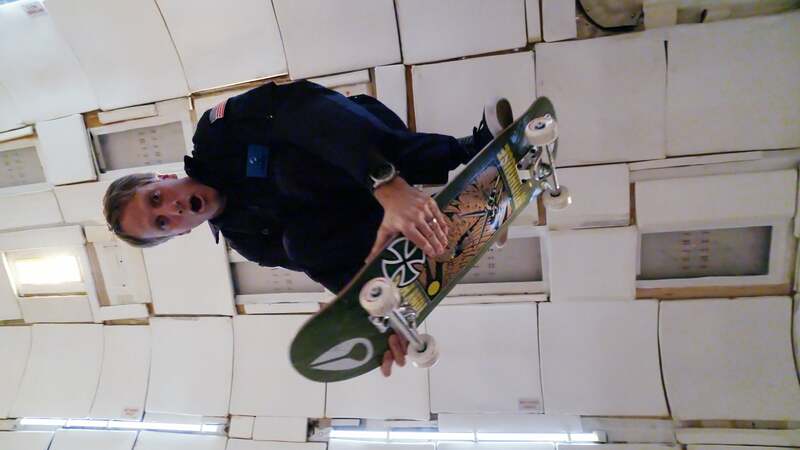 “With Zero G, well one day our editor was joking about breaking "skate records” in space. Months later that idea came back to me and I thought well, maybe not space but zero gravity could be a real possibility. I was pretty sure Tony would be into the idea and sure enough he was. “I’m usually shooting athletes showing off their skills that they’ve practiced and worked on over and over…I’m shooting their pinnacle achievements at times. On this shoot, I was filming someone who’s normally seen as one of the best in the world in his sport and in that environment he was no different then just about anyone else. Inside G Force One, the playing field was leveled. There’s no precedent when it comes to skating in zero g and so there were very few expectations. While both Tony and Aaron wanted to try some tricks, we knew going into this that the main goal was to have a blast and do something new." To create the film, Prindle and his team had a variety of Sony cameras in the air and on the ground. He describes the shooting situation, "We brought 6 cameras to the shoot including a pair of 4K Action Cams mounted to the fuselage and an α7S II used primarily on a Ronin stabilizer. We also had an FS5 which was pretty new to us and two FS7’s. All the cameras besides the Action Cams were handheld. We’ve been using Sony’s Action Cams from pretty early on. I think we’ve used every model that they put out and all throughout the world. If you travel a lot, an Action Cam is like extra underwear…a no brainer. “I purposely kept my setup as simple as possible. I left the eyepiece and grip behind just because I absolutely didn’t want to get sick and ruin the shoot. I felt that if I could keep my head up most of the time rather then staring through an eyepiece, I’d have a better chance of making it through this adventure. Our other cameraman chose to use the grip and eyepiece and he survived so it’s hard to say what was the right choice. I’ve been shooting with fisheyes and ultra wides for so long without an eyepiece, and often while I’m skating or dipping the camera low in an arc, that I’m pretty confident doing so." The team shot in 4K even though the output was going to be HD. Prindle explains the choice, "The 4K for HD workflow was a real lifesaver on this shoot. I’d expect that most people think they don’t need a 4K cameras because they don’t have jobs that require 4K outputs. In some situations, that may be true but there are so many instances where 4K is a huge help and this shoot is a perfect example. We intentionally shot very wide not only because we were in a tight space but because we had a limited crew and we knew the difficulties of framing a good shot. In post we took the wide 4K images, and either pushed in a little bit to recompose or a lot to crop out objects and people floating into the shot. Beside fixing bad shots, you can get two different shots from one camera and that’s super helpful whether your floating in zero gravity or on the ground shooting scenery." Prindle has relied on Sony for years and for this shoot, he wouldn't have it any other way. "Sony has always meant getting "the most bang for your buck" to me. I think my first 4 cameras in the 80’s and 90’s were Sonys and although I’ve used many other brands, when it comes to spending our money, I come back to Sony. Sony’s current line up is the best it’s ever been. There’s a lot of new cameras coming out from all directions. Some look really cool and hip and some have interesting specs on paper, but I’m happy just knowing that whether I’m about to enter my first zero gravity parabola or I’m shooting a once in a lifetime stunt that I don’t have to even think about problems, quirks and workarounds with my gear. There’s no second takes with a lot of shooting we do and I need to know I got the shot. With the Sonys I have that confidence." Check out the behind the scenes video from the shoot.